..... Balance Trading .....: SGS Turned "Neutral"
Indices sold off sharply today. Big Money was busy unloading his longs positions, specially his small caps. Per my plan I liquidated my LT portfolio early today. 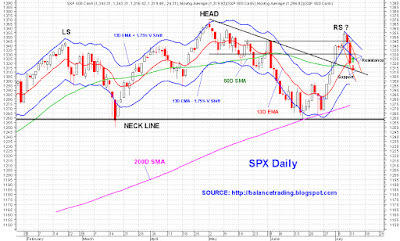 My plan now is to start to scale into short positions as soon as we have a close below 50D SMA for SPX. SPX dropped out of its down trending price channel (blue) and into a much steeper down trending price channel (orange). It also tested its 50D SMA with very little bounce. 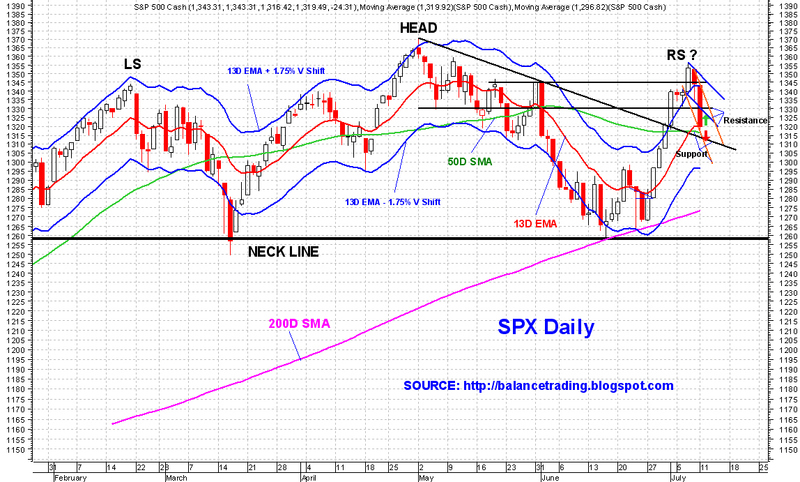 Tomorrow, SPX very likely retests its 50D SMA again and could close below it. The only thing that could save the bull run is fantastic earnings and guidance by companies. Of course, we should never underestimate the power of the QE side, but not likely until this fall.